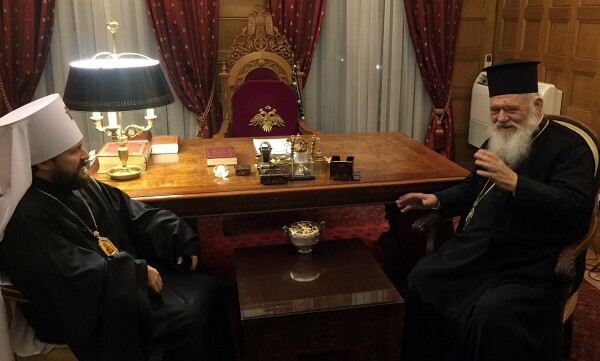 On 17 December 2015, Metropolitan Hilarion of Volokolamsk, chairman of the Moscow Patriarchate’s Department for External Church Relations, who had arrived in Athens with the blessing of His Holiness Patriarch Kirill of Moscow and All Russia to take part in a session of the Special Inter-Orthodox Committee for the Preparation of the Pan-Orthodox Council, met with His Beatitude Archbishop Hieronymos of Athens and All Greece. The participants in the meeting, which was held at the premises of the Archdiocese of Athens, discussed various issues on pan-Orthodox agenda. Among those who took part in the meeting were also archpriest Nikolai Balashov, DECR vice-chairman, and Rev. Anatoly Churyakov, DECR staff member, who are accompanying Metropolitan Hilarion on his visit to Athens.